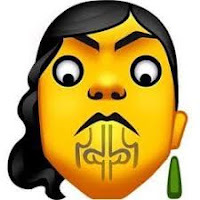 I've been learning about Tikanga. The main reason being that I wanted to know that our local marae was running properly. What I've read thus far negates anything I've seen being done in the last few years at the marae. Tikanga Maori by Hirini Moko Mead tells you how the education of Tikanga came about. It all had to do with rugby and the apartheid in South Africa. Interesting story that I won't go into here, but in 1979 it became a course as a part of Maori Studies at Vic Uni. I was speaking with someone recently who told me that there is no value in learning tikanga. There is no relevancy for it inside and outside of New Zealand. Half way through the Living by Maori Values book, I quickly learned that it was a pretty racist thing for her to say and if I really wanted to, she'd have no job because of her comments. I always wondered why I always got told off for leaving the hair brush on the kitchen table or for brushing my hair in the kitchen. The body is tapu (sacred) and food is noa (common). Don't wash the towels with your clothes. Don't sit on pillows because it is for the head, which is the most tapu part of the body because it processes and stores knowledge. Don't step over people, it's a sign of disrespect and a few other customs that made me realize my Aunties had been teaching me tikanga my whole life. What it has taught me is that our marae is definitely not running properly. That is obvious externally and internally. Tikanga maori is learned by observing and practicing. All I've learned in the last year from my extended family is that they oppose each other like school kids. After Tane-Mahuta separated his parents, his brother - Tawhirimatea (Wind God) took issue with the separation and vowed revenge. In turn, he heaved winds and storms at his brothers. The only one who withheld Tawhirimatea's rage was Tumatauenga, the God of Man. He decided all his brothers were weak, got angry about it and turned the children of Tane-mahuta and Tangaroa into food and materials. What's the point of this story? It's a perfect example of seeing something tapu (sacred) turning into something noa (common). Our marae hasn't been sacred for years. It's currently in a state of noa because of it's own people, who make up a family. My family. I now know enough to decide that my association with my marae will be minimal until they get their tūtae together.